The High Resolution Stereo Camera (HRSC) is Germany's most important contribution to the European Space Agency (ESA) Mars Express mission. The HRSC camera, developed at the DLR Institute of Planetary Research, is a unique experiment. For the first time, a special camera on board a spacecraft is continuously acquiring images of the planetary surface in three dimensions and in colour. The results will enable researchers to answer fundamental questions about the geological and climatic history of the Red Planet. The HRSC camera system, which only weighs 20 kilograms, has two camera heads: the High Resolution Stereo head, which consists of nine CCD line sensors mounted in parallel behind a lens, and the SRC head, which is composed of a mirror telephoto lens and a CCD array sensor. The High Resolution Stereo Camera (HRSC) is Germany's most important contribution to the European Space Agency (ESA) Mars Express mission. The main objective of this mission, which reached Mars in late 2003) is the search for traces of water and signs of life. During the expected four-year mission, seven instruments on board the orbiter will gain new insights into the composition and geology of the surface of Mars and the atmospheric composition by means of various remote sensing experiments. The instruments on board the orbiter have been designed specifically to map the surface of Mars in high resolution for photo-geological and mineralogical investigations, and to study the Martian atmosphere and its interaction with the interplanetary medium. The High Resolution Stereo Camera, developed at the DLR Institute of Planetary Research, is a unique experiment. For the first time, a special camera on board a spacecraft is continuously acquiring images of the planetary surface in three dimensions and in colour. The results will enable researchers to answer fundamental questions about the geological and climatic history of the Red Planet. The spatial resolution of the stereo images surpasses previous topographic data of the surface of Mars from a distance, and allows geoscientists to analyse details down to between 10 and 30 metres in three dimensions. As a special feature, the camera contains an additional, ultra-high-resolution telephoto lens. With this Super Resolution Channel (SRC), imaging objects two to three metres in size - embedded in the stereo image data - is possible. This allows, for example, identifying boulders the size of a garage or stratification in sedimentary rocks. 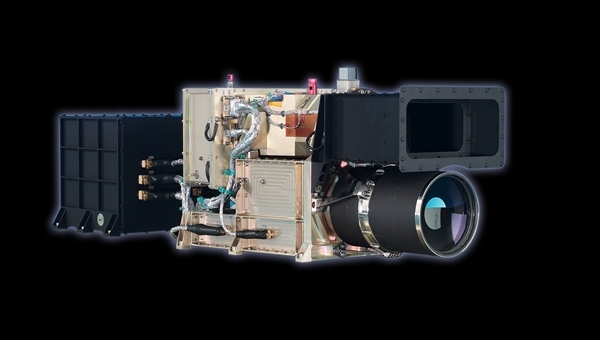 The HRSC camera system, which only weighs 20 kilograms, has two camera heads: the High Resolution Stereo head, which consists of nine CCD line sensors mounted in parallel behind a lens, and the SRC head, which is composed of a mirror telephoto lens and a CCD array sensor. The High Resolution Stereo head works on pushbroom mode: sensors image a line on the planet surface perpendicular to the ground track of the spacecraft and rely on the orbital motion of the spacecraft to reposition them as they record a sequence of images known as an image swath. In this case, each sensor records the same object on the surface at a different angle. Three-dimensional images are generated by five of the image strips. The remaining four of the nine line sensors are equipped with special colour filters for recording multi-spectral data. The shortest distance from the spacecraft to Mars is 270 kilometres. At this altitude, the resolution of the 9 image strips is 12 metres for each of the 5184 seven-micron square pixels. The image swath is 52 kilometres and the minimum strip length 300 kilometres. The latter depends on the spacecraft's data storage and transmission capacity. The Super Resolution Channel (SRC) is used as a magnifying glass. At the pericentre, it provides pictures 2.3 kilometres by 2.3 kilometres wide in the centre of the image strips; the surface details are imaged with a resolution of 2.3 metres per pixel. The SRC recordings provide a geological context of the area, which is supplied by the high-resolution images acquired with the stereo head. Before the data is transmitted, the images are compressed in the HRSC unit and stored in the spacecraft. On Earth, Mars recordings are first systematically processed at the DLR Institute of Planetary Research, and then distributed for further processing and analysis to the over 40 co-investigators from 33 institutions and 10 countries that make up the HRSC science team. Since 1997, two versions of the HRSC been modified for aircraft use. These have already demonstrated the robustness of the HRSC design and the scientific value of HRSC technology in various flight campaigns. The HRSC camera on Mars Express was developed by the DLR Institute of Planetary Research, which is responsible for its operation as well as the processing and distribution of the image data throughout the entire mission. The systematic processing of the HRSC image data is carried out at DLR and scene processing is carried out by the PI-group at the Institute for Geosciences of the Freie Universität Berlin in cooperation with DLR's Institute of Planetary Research, Berlin. The German HRSC-SRC experiment on board Mars Express is headed by Principal Investigator (PI) Prof. Ralf Jaumann, from the DLR Institute of Planetary Research. Why are three-dimensional images needed in planetary research? The investigation of surface structures using remote sensing is dependent on three-dimensional information for many quantitative measurements – for example, cross sections of valleys and volumes of mountains. The topography or relief of the surface provides important information for the geomorphological and geological interpretation of planetary images. A stereo camera has previously never been used in planetary research. Although numerous images exist that more or less coincidentally – and in rare cases deliberately – depict the same regions from a variety of viewing angles, the results are either of insufficient quality, have poor resolution, or are restricted to very small areas. There are examples showing the surfaces of planets (Mercury, Mars), moons (Earth's Moon, the Galilean moons of Jupiter) and asteroids (Ida, Gaspra). In most cases, however, other data has been necessary to derive topographical information. Often, this involved the use of radar instruments that were able, for instance, to penetrate the dense atmosphere enveloping Venus and create a three-dimensional image of its surface. Lasers have produced outstanding results in recent years. Here, a spacecraft transmits pulses of laser radiation towards the planet; these are reflected off the planetary surface. The spacecraft receives these reflected pulses and determines the distance between itself and the surface based on the round-trip times. This technique is referred to as lidar – light detection and ranging. Since the distance between the spacecraft and the centre of the planet is known, it is possible to determine the distance from there to the surface, that is, the elevation of the surface. An example of a successful lidar instrument is the MOLA (Mars Orbiter Laser Altimeter) instrument on the Mars Global Surveyor spacecraft, which has collected over 600 million individual elevation measurements from the surface of the Red Planet. These measurements were used to create a global digital elevation model with an absolute vertical accuracy of approximately 10 metres. The horizontal resolution is poorer, however, varying from 300 metres close to the poles to several kilometres near the equator. This is due to the polar orbit of Mars Global Surveyor. Its orbits intersect at the poles, where a very large number of measurement points are located in a small area. In contrast, the ground tracks across the equator are widely spaced, so it is here that the stereo information obtained by the HRSC is particularly valuable. What happens when we observe something with two eyes? Humans and animals with both eyes facing forward have the capability to perceive their environments in a spatial sense, meaning in three dimensions. This requires interaction between the eyes and the brain. The human eyes are located approximately seven centimetres apart, so the two optical systems (the left and right eye) see each object from a different viewing angle. The brain uses stereoscopic vision to process the images obtained from both eyes and to create an impression of spatial depth – the stereo principle. However, the information acquired about distances is based on experience and does not represent absolute, exactly defined measurement values. A stereoscopic camera operates in the same way. It takes images of an object from different viewing angles and the information contained in each of these images can be processed to derive spatial data. The science that deals with these procedures is known as photogrammetry (from the Greek 'phos' for light and 'metron' for measurement; the neologism therefore means 'measuring with light'). Photogrammetry deals with the acquisition and processing of information about objects and processes by means of images, primarily to determine the shape, size and location of those objects, using photographic images as the information source. The images are obtained using photogrammetric recording techniques and processed using photogrammetric evaluation. Digital photogrammetry describes scenarios in which digital images are used (as in the HRSC). terrestrial photogrammetry using images obtained on the ground.